Natural Watermelon Fluoride Free Toothpaste <br /> <br />Use: Helps remove plaque with regular brushing. Ingredients: Sorbitol (Humectant), Hydrated Silica (Polishes and Cleans Teeth), Purified Water, Vegetable Glycerin (Soothes and Moisturizes), Aloe Vera gel (Soothes and Moisturizes), Xylitol (Sweetener), Natural flavor (Yum), Xanthan Gum (Thickener), Lauryl Glucoside (Coconut/Palm and Corn Derived Cleanser), Calcium Glycerophosphate (Mineral), Titanium Dioxide (Mineral), Potassium Sorbate (maintains Stability) and Stevia Rebaudiana Leaf Extract (Sweetener). 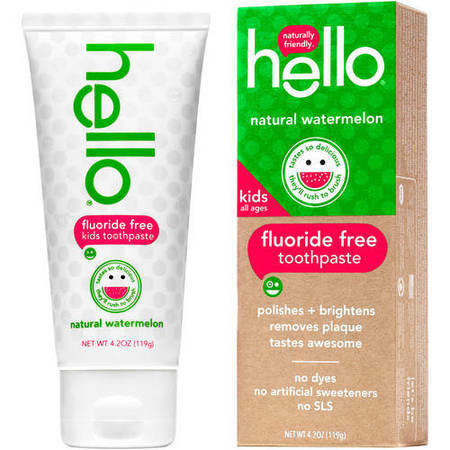 I love everything about this watermelon fluoride free kids tooth paste. The smell is good, the taste is good enough to eat, and it truly cleans so well. It makes my sons breathe so much better after they brush their teeth. After my 4 year old brushed his teeth he was so happy & said that it made his teeth so sparkly! We can't wait to get more! I was given this sample to try in exchange for my opinions. I was asked the sample the Watermelon flavor toothpaste. While using this sample my 3 and 4 year old were excited to brush, and did so without a hassle. The toothpaste smells great, it's all natural and it works great. We have had great success using this toothpaste and I would recommend it to others.